Nowadays, people show more concern and interest in the appearance and design of e-cigarettes. 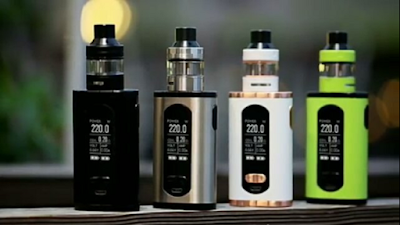 Most of them want to choose a fashionable vape to demonstrate their personality and at the same time, they are also demanding about the quality of it. Therefore, manufacturers are attempting to win customers by creating more beautiful and powerful vapes. Take a look at it, you will find the conspicuous screen on the front face with a super large size of 1.3 inch, offering you a clear display of all the data. Exquisitely designed, it adopts a ergonomic shape for comfortable handing of the vape. The mod is simple and classic. For this beautiful vape, Eleaf has offered four colors; Black, Greenery, White, Silver. Eleaf Invoke with ELLO T kit is really a vape beast however, this does not indicate the size of it is as large as a beast. What the beast implies is the power of the vape. With a compact size, it packs dual 18650 cells and has a maximum output powerful of 220W. In addition to its high watt, it also has impressive features. 2A current for quick charge and upgradeable firmware would also be the spotlight of the whole vape kit. Eleaf Invoke with ELLO T with a affordable price is really a perfect device for people who are in the market for one. Believe me, you will look more charming when vaping it and become the focus of the cloud.